What is better than getting a dog on your birthday? Maybe a dog that can fly? How about a dog that can fly AND thwart a burglary? 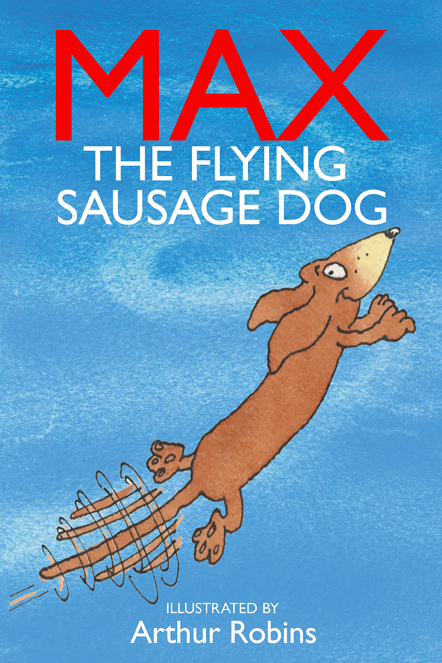 Throw in some sausages, set the story in London, and you have the brilliance and magic that is Max the Flying Sausage Dog. When the story begins, we’re introduced to Tom on his seventh birthday. Tom is one fortunate young man, because today his mother is taking him to The Last Stop Dog Pound to adopt a dog. The Last Stop Dog Pound is not a happy, cheery place, and seeing the conditions in which they live, he wants to bring them all home. Alas, he can only choose one. Tom falls in love with a funny looking dog that seems to smile at him. He names him Max, and then the fun really begins. 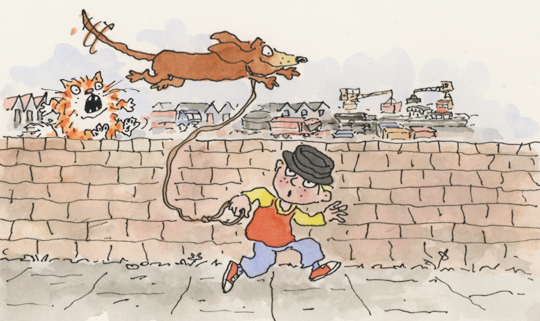 When Tom takes Max out for a walk, and after a mild brush with some bullies and a ginger cat, Tom realizes that if they don’t head home soon, they’ll be late for his birthday tea. What’s more — they’re having sausages! You just don’t want to be late for sausages! But what happens next? (Cue dramatic organ music.) What is it that makes Max fly? Will his parents find out? What’s happening next door? Is that a burglary in process? What can Tom and Max do? How will they save the day? Oh it is glorious fun! This is hands down one of our favorite books ever. My eldest son loves this book so much that he actually applauded at the end and then asked for us to reread it immediately. He also laughed the hardest I have ever seen him laugh at anything. I had to stop reading and wait for him to calm down because he was laughing so hard. The first time I read it to him, I thought it was a fluke, maybe he’s just tired and giggly. But no, on each subsequent readings, he giggles and squeal and has a blast. It’s incredibly satisfying to read this magical book to him because it makes us so happy and giggly. 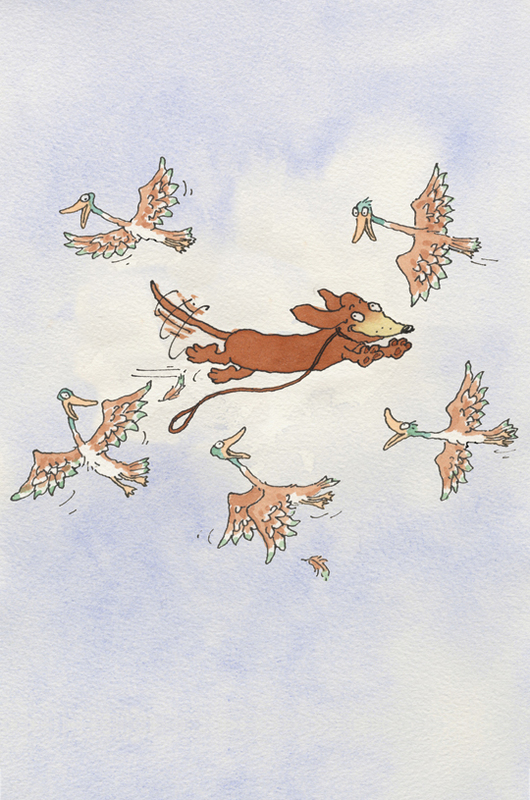 I hope you get a chance to check out Max the Flying Sausage Dog. It’s great fun! I also hope that your little ones laugh as hard and enjoy this boook as much as mine does. Roughly Ages 3 to 12. Words in the Works. June 2014. 50 pages. ISBN: 978-0991036455 Fiction. [Independent Bookstore] Indiebound.org — Ask your local bookstore for it. [Library] Woldcat.org — Ask your library to order it. This book is pure magic. I love how the story draws you in and create a world where something impossible seems completely plausible. The book begins with a small glossary of sorts for American readers to introduce them to several terms and phrases that are used in England. This is an informative reference and also draws the readers in and makes them laugh. So even before the story begins, my son and I are laughing and repeating the phrase, “What the monkeys?” Which is now a regularly used phrase in our house. It’s an awesome book! It is 50 pages and split into chapters. It’s a great chapter book that still very much feels like a picture book. I adore the tone and quirky characters and how the underdogs save the day. There are loads of great messages in the book from adopting animals to punctuality to bullies to friendship — but yet completely engrossing and entertaining. It’s a long-ish book — so it’s great for when you can only bring one book with you. The illustrations are fantastic! They are just enough to set the tone while still giving your imagination enough freedom to fill in the rest of the story. 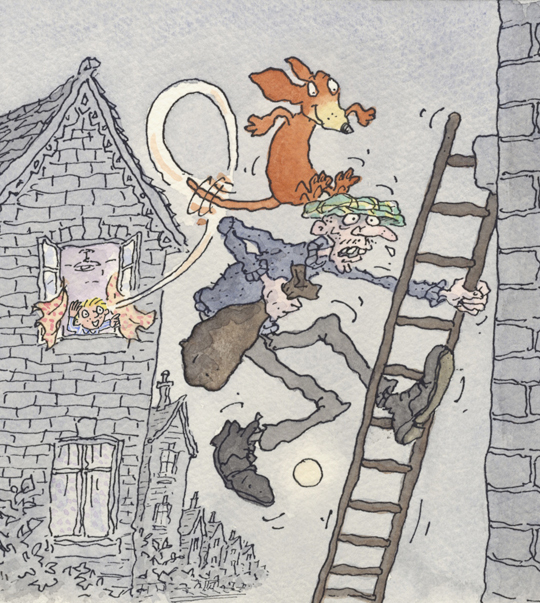 The illustrations are quirky, whimsical, and very happy! It’s easy to fall in love with the story from the illustrations alone. On one hand, Max the Flying Sausage Dog is funny, silly, crazy, and plays to everything you could ever want in a dog. On the other hand, this book addresses dog shelters and euthanasia in a very direct way. It strikes a good balance between fun and the reality that there are dogs in shelters that desperately need homes. After reading this book, my son started asking us if we could get a dog from a shelter. Before he would just ask for a dog, now he wants to make sure it is a dog from a shelter. Truly, I have never seen him laugh this hard at anything. (Cute kitten videos included.) It’s a wonderful book, and I’m so excited to see that there are more Max adventures in the works! 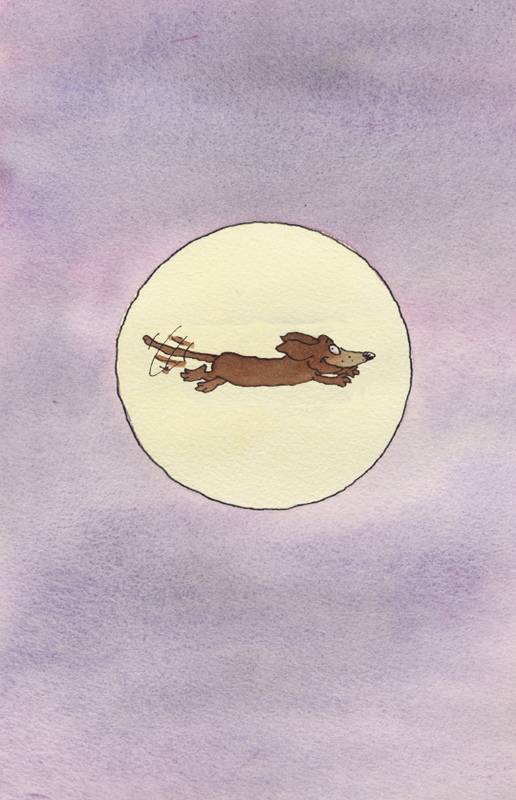 From Max the Flying Sausage Dog. Image Courtesy of Richard Kelly. So cute! I would love to get this book to donate to the MKs. Oh! Sometimes I dream that I can fly!!! Max is my dreams come true!!! I love flying dreams! They are some of my favorite! Flying and sausages? I dare say that is a perfect formula to make a happy dog! Well, this is definitely a good reason for people to visit dog pounds, I think 🙂 And your son’s applause is a DEfinitely great recommendation! Unfortunately, my library system doesn’t carry it 😦 Is it a very new release? It is a relatively recent release. Have you had much luck requesting books for your library to purchase? I’ve been surprised at how accommodating my library has been in purchasing my requested books. Alas! If and when you do see — give it a read. I’d love to know what you think! I always enjoy your perspective!